Can you believe that Valentine’s Day is almost here? My little grands are so excited! I wanted to find a way to help them count down the days and work with numbers and dates at the same time…win win! They had really enjoyed the Advent calendar at Christmas time so when I saw the Valentine Countdown Calendar at Pottery Barn Kids, I knew I had found the perfect solution! Cut out the red felt to create the banner. I used the dimensions in the graphic above. An extra 2 inches is allowed at the top to fold over to hold the dowel rod. Print the graphic above to use as a guide. My numbers were 2 inches tall. 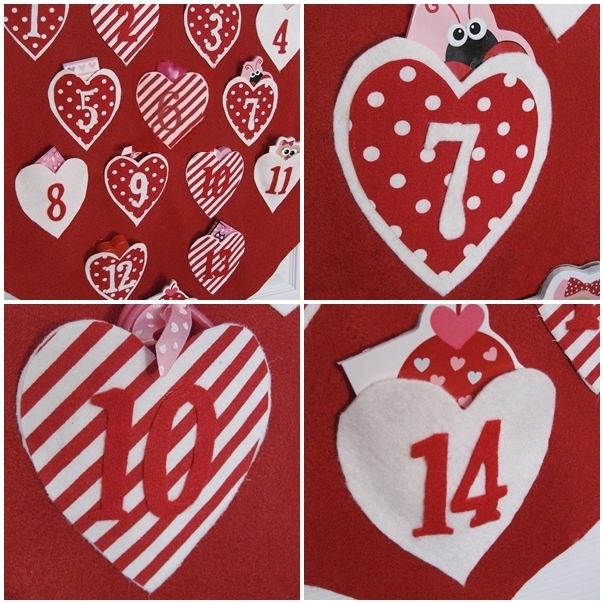 Cut out the numbers from felt, using either red or white, depending on the coordinating fabrics you have chosen. You can consult my photo to see how I chose to do mine. Cut out 14 hearts from white felt, using the graphic above as a guide. You may have to resize it to fit. The white hearts were 4 1/2 inches tall. Cut more hearts in a slightly smaller size in the coordinating fabrics in whatever number you wish. You can use my photo as a guide if you wish. You will see that I left some of the white felt hearts plain. Create the hearts by layering the fabrics and numbers and adhering them with fabric glue. Allow them to dry. Press the top 2 inches of the banner toward the back to create what will become the pocket for the dowel rod. Arrange the hearts on the banner in a pattern that pleases you and attach them to the banner, applying a bead of fabric glue on the outer edge and leaving the top portion open to create a pocket. Don’t worry if it’s a little messy since the glue dries clear. Allow to dry. Spray paint the ends of the dowel and the caps white and allow them to dry. Attach the caps to the dowels with hot glue. Apply fabric glue to the 2 inch fold on the inner edge, place the dowel in the fold and then smooth the fold as close to the dowel as possible. Allow to dry. Tie a piece of yarn to both ends of the dowel to allow for easy hanging. Create the tassel using the tutorial found here and then attach it to the bottom end of the banner with a small bead of hot glue. And here’s the finished project! I love it! And just in case you are looking for some more fun ideas for Valentine’s day, you’ll find some here! Baby Kitty says that the Bunny Love pillow is his favorite…but I don’t think it’s for the same reason that it is mine! How about you? Are you ready for Valentine’s Day? Too cute and simple too. Stopping in from Met Monday.